Products for printing industry|TAIYO CHEMICALS & ENGINEERING CO.,LTD. Elastic Recovery Agent and Cleaning Agent for blanket (also cleanse roller). May be used as a degreasing agent, stain remover, release agent and cleaning agent. SUNECON R-4052E is an environmentally friendly dipping type cleaning agent that does not contain any chlorine-based solvent. It is slightly alkaline but can be used on non-ferrous metals (e.g. Aluminum) and plated product. 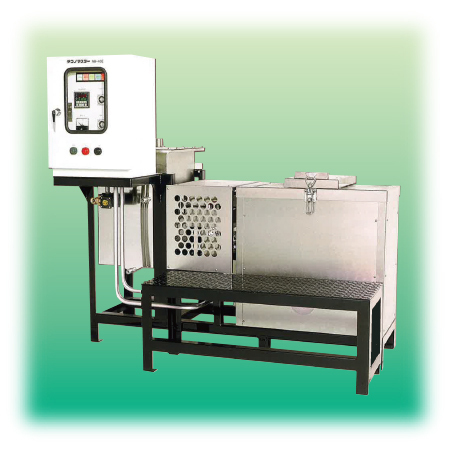 Effective utilization of resource and cut the costs by minimizing industrial waste. used: Toluene, Xylene, Methyl Ethyl Ketone, Methyl Alcohol, Ethyl Alcohol, Isobutyl Alcohol, Isopropyl Alcohol, Ethyl Acetate, Butyl Acetate, Acetone, Torr Trichlorethylene, Perchlorethylene, Methylene Chloride, etc. Mixture of these solvents are also applicable. Uses indirect heating by using thermal oil. Uses atmospheric pressure distillation to prevent extra pressure to apply on the device. Takes countermeasures against foaming liquid wastes to block gas passages. Designed to prevent water from entering jacket. Equipped with overheating prevention control. Equipped with alarm to notify the need for exchange. Use of double-sided heat transfer surfaces and plate coils with the 18L containers balances evaporation and condensation. Reduces cooked-on residues and foul odors. Reduces corrosion through use of chlorine solvents. Viscous waste liquids can be reprocessed. Compact size only takes small space.